Under the leadership of Dr. Bruce Maxim, the CIS Department created the G.A.M.E. 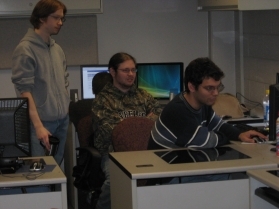 (Games and Multimedia Environments) Laboratory where students can use sophisticated hardware and software to create computer games that contain user interactions that are as rich and exciting as those found in commercial games. 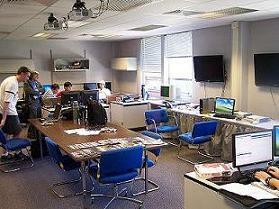 This laboratory, housed in CIS 239, supports the department's activities in game design. 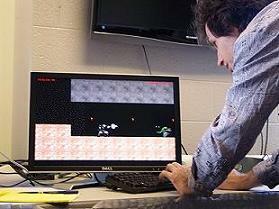 This game development laboratory provides students with space to do interesting, innovative, and collaborative work. Students taking our second game design course often work with CCS students on interdisciplinary project teams to create high quality 3D video games. We have expanded our collaborative activities to include year long senior design projects with local game developers, graphic designers, and University of Michigan faculty. Download Visual Studio 2015 and other Microsoft Developer Tools from Microsoft DreamsSpark Downloads with your student ID for FREE!